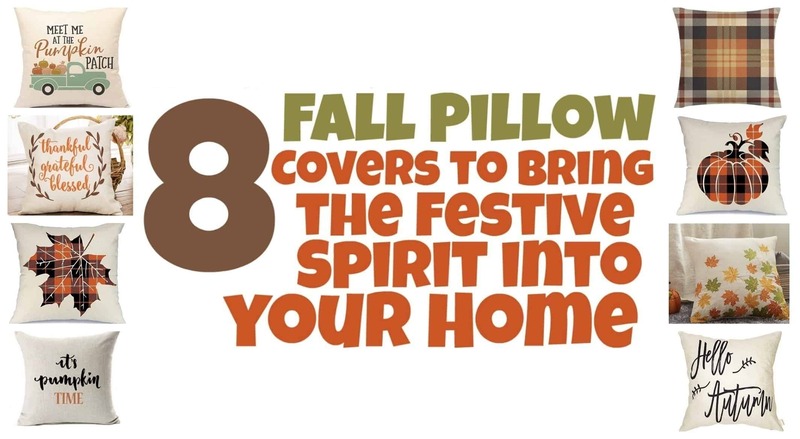 Here are 8 Cozy Fall Pillow Covers to Bring the Festive Spirit into your Home. I love decorating for the holidays. The fall season and the Christmas season are probably when we decorate the most. We have a lot of family come over for Thanksgiving so I love making our house look festive for the holiday. One of my favorite holiday decorations are holiday pillows. I don’t know what it is about decorative pillow covers but they add a lot to making your couch or chair look more festive. They are a lot of fun and make your house more cozy. Pair with an adorable fall blanket for the perfect cozy look. Why would I want a Pillow Cover? Throw pillow Covers are nice because they are easy to store. Each holiday I use the same pillow inserts and switch out the pillow covers. I can fold up the holiday pillow cover nicely and store it with my holiday directions. Note: In order to have the perfect fitting pillow, it is recommended that you choose a pillow that is 2 inches big than your pillow covers. For example, if your Fall Pillow Cover is 18×18 inches, you would want a pillow insert that is 20×20 inches. This is the pillow set that I found is the best for my money. You can get them in smaller sets but I have found that four is a good number. Each holiday I use the same pillow inserts and switch out the pillow covers.